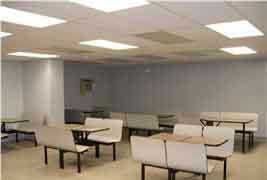 Modular Prefabricated Lunchrooms & Break Rooms. Maintaining a high morale level amongst staff can have a major impact on their productivity, and one of the best ways of making employees feel valued in their work is to provide them with space in which to relax and unwind during their breaks. While it may seem counter intuitive to invest a large sum of money in a non work facility, a break room can make a big difference to how happy staff are at work, and improve retention. With a modular lunchroom, you will be able to provide space within your existing building where staff will be able to gather for meals and breaks without having to invest in a special construction project. A modular lunchroom is a fairly simple addition to any business premises, and Easy Rack can help you with a number of different designs to suit all sizes of business, and all levels of investment. Choosing the right system for your business, and fitting it out with appropriate furniture will provide you with an added dimension to your premises, and allow for staff to stay on site throughout the day. The most important thing to think about when planning a break room is the size of facility that you need. While most companies stagger lunch breaks for staff so that many employees remain at work at any one time, it is advisable to provide space for all staff so that large meetings and other get togethers can be held in one place. 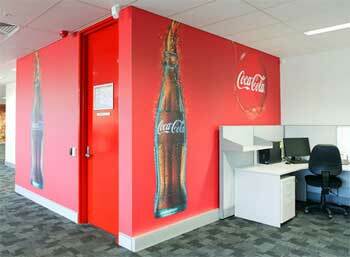 It is also important to decide exactly what kind of facilities that you want to offer within your break room. Are you simply going to provide a shelter where staff can go in between shifts, or do you want to include full recreational facilities including power supplies and sofas. A larger modular lunch room can be separated into different sections for various purposes, and provide a much larger range of activities than a simple shelter, but the installation cost will be much higher than a less complex system. The biggest advantage that you get from choosing a modular system for your break room is that it can be changed and repurposed over time to ensure that it always meets the needs you have set out for it. If you start off with the installation of a straightforward place where staff can sit and eat their lunch, and your needs change, with a modular lunchroom, you will simply be able to change certain areas of the construction to meet your new needs. Additional space can be added by installing a few extra panels in the walls, and the interior of the room can be changed entirely by moving the walls to create almost any layout that you can imagine. Aside from the fact that the new modular lunch room can be installed in as little as a day, compared to several weeks for a traditionally constructed breakroom, there is also a tax benefit from choosing a modular building. The temporary nature of the structure means that you can recoup the costs of depreciation over just 7 years rather than 39 for conventional buildings, which can save you a great deal of money in the short term. Modular Cafeteria. One of the most immediate benefits of installing a modular cafeteria within your building is that the work can be carried out in about a third of the time that conventional methods would take.